Once the program started, Falwell made the usual jokes about how all that week his group had been "Running where Jesus had walked." Then the first guest got up to speak and he was no less than Gen. Ariel Sharon. He had been the commanding general of the Israeli army that had invaded Lebanon a couple years previously. Israel was now stuck in their own form of a Vietnam War that they couldn't dislodge themselves from. I was puzzled at the choice of him speaking. First, he certainly wasn't a Believer. Second, soon into the invasion of Lebanon in 1982, troops under his direct command had stood across the road from the Sabra & Shatila refugee camps as Israel's allies, the Christian Phalange militia had gone in and slaughtered upwards of 3000 unarmed Palestinian women and children. An odd choice indeed. The final speaker of the evening was Dr. Tim LaHaye. (You might have heard from him through the Left Behind series that he co-authored.) Dr. Tim said that he would explain the prophecy on Ezekiel 38 & 39. He said that what God was telling Ezekiel was that the Soviet Union was going to invade Israel, but then be destroyed by fireballs from heaven. He went a bit further saying that all communists everywhere would be killed off, and to my dying day I will never forget the reaction of the crowd. Dr. Tim ended his lecture by saying that it wouldn't just be Soviet communists that would be destroyed. No. He framed his final sentence in the form of a question. "And won't all the American colleges and universities be surprised when they wake up to find that half of their professorial staffs have been destroyed by fireballs from heaven?" At that, the crowd leapt to it's feet and cheered. I can still hear those southern accents cheering "Ay-May-en." It was at this point that I asked myself a question; "Is it right for anyone to be so happy at God killing people and sending them to Hell?" God is the righteous judge, to be sure. But does that mean that a Believer should be happy about someone else being punished by God? Doesn't God explicitly warn against that? Myself and the three other students from our school remained seated. Up until that point I had been a big fan of the Religious Right. I thought that America needed protection from the evil, secular lefties out there trying to throw Christianity out of America. To this day, I am still a fairly conservative guy...I really am. So, you can probably guess which party I vote for more often then not. That having been said, I'm not a fool either. I remember during the 1984 Presidential election seeing a guy carrying a sign that said "God is a Republican," and I agreed with him. It took me a few years of soul searching and researching to come to the painfully obvious fact that, no, Jesus is not a Republican. Neither is he a Democrat. As it turns out, Jesus is not a member of the Labour party, the Conservative party, or the Parti Quebecois either. In fact, it is questionable whether Jesus even believes in democracy. After all, he is a king. Many people will say that America is a "Christian" country. Really? Since when? Were we a christian country when we enshrined slavery into our constitution? How about when we made Jim Crow the law of the land in the southern states? Were we a christian country when we slaughtered the Native Americans during our westward expansion? The only "Christian" country that I know of is not a representative democracy. It is actually a dictatorship, albeit an enlightened one. It is a divine right absolute monarchy. It is called "The Kingdom of God." Scripturally, that is spot on. Now I don't want anyone to think that I am ragging on the U.S., because I am not. I love America. I love the uniqueness of our country. Most countries were created around an ethnic group. America was an idea, long before it ever became a country. That alone is amazing! Not to mention that members of my family & friends have given their lives for this country. I LOVE America! But I DO NOT believe that America, or ANY other country, is a "Christian Country." We need to to be very careful about that name. The problem with calling a country, any country, a "Christian" one is that you drag Jesus into all of the mistakes that that country makes. Heck, Hitler called himself a christian when it suited his needs. His Wermacht had "Got Mit Unse" (God with us) printed on their belt buckles as they invaded Poland. Countries are run by fallen people who make mistakes. Jesus doesn't make mistakes. It also smacks of idolatry when you equate a nation with Jesus. The founding fathers of the U.S. were great men, but only a handful of them were what we would now term Evangelicals. Guys like John Adams and James Madison could sign the statement of beliefs of Bethel University or Wheaton. Jefferson certainly would not sign it. He was to busy cutting all of the miracles of Jesus out of the New Testament to make his famous Jefferson Bible that you can find in most libraries. Ben Franklin wouldn't sign those statements of beliefs either. He was having to much fun looking up ladies petticoats in Paris. In their book, Un-Christian, David Kinnaman & Gabe Lyons have a chapter titled Too Political. The perception of Christianity that young people have today is that Christians are primarily motivated by a political agenda and promote right-wing politics. You don't have to like that perception, but that is a fact. Two weekends ago, the Values Voters summit was held in Washington D.C. This was a meeting of primarily the religious right and their allies. Needless to say, it was almost exclusively Republican in nature. Dr. James Dobson was there, along with Mike Hukabee and even our Governor, Tim Pawlenty. What was interesting to notice was that the only two values that these voters cherish are No Gay Marriage, and No Abortions. There was nothing said about poverty, homelessness or the fact that over 30 million Americans have no health insurance. Those two items were the only items of value to the people. I still have no idea why. Environmentalism was brought up at the summit. As it turns out, the whole climate change thing is all a big hoax, and we have nothing to worry about. So apparently that air that I was able to chew when I was in Beijing two years ago was all in my head. It's good to know that it is all a hoax, because I would like to invite all of the readers of this blog to join me on the river banks where the Minnesota river runs into the Mississippi. We shall then fill up some empty gallon jugs with the river water and proceed to have a chugging contest. So come on down and bring your imodium. I find it odd that a group that uses the word CONSERVative wouldn't be interested in conservation. Further more, I find it even stranger that these people would disobey God's second directive to humans. After all, in the second of the three creation stories, right after God tells people to be fruitful & multiply, He then tell us that we are supposed to be responsible for the whole creation that He so painstakingly made. Could it be that there are other legitimate issues out there that American Christians should value? Chuck Colson stated in his book Kingdoms in Conflict that Christians should never have a political party. He says that "It is a huge mistake to become married to an ideology, because the greatest enemy of the gospel is ideology. Ideology is a man-made format of how the world ought to work, and christians instead believe in the revealed truth of Scripture." Jim Wallis of Sojourners wrote an essay in which he says, "Evangelicalism has been hijacked and usurped by a partisan political forces. Conservative religion is now being driven and dictated by secular right-wing political forces." I think he is exactly right. In central Israel there is an archeological site called Tell Hazor. It was one of those city states that existed 4000 years ago. We went to the diggings there and poked around. Apparently, in it's time the city of Hazor was so wealthy that it could simply buy off it's enemies. It was extremely influential and powerful in it's day. Now all that is left of it is a huge lump of dirt in the Jezreel valley. As we stood there looking out over the valley, one of our instructors opened up his Bible and read from Isaiah 40. "All men are like grass, and all their glory is like the flowers of the field. The grass withers and the flowers fall, because the breath of the Lord blows on them. Surely the people are grass. the grass withers and the flowers fall, but the word of our God stands forever." America is like the city state of Hazor. So are all nations. They are temporal and finite. Some countries last for centuries. Some only last a few decades. All countries will wither and fall. But the Kingdom of God last for eternity. A week after visiting Tell Hazor I went to a theater in Jerusalem. I saw Blade Runner. (Most critics consider it to be the best science fiction movie of all times.) The basic plot of the movie is about a cop who is hunting down Replicants. Replicants are a sort of manufactured human that has only a short life span. They do all of the dirty work on planetary colonies and such. A group of them have escaped and come back to earth. They are trying to seek out the man who created them in hopes that he can extend their lives. The cop tracking them is played by Harrison Ford. The last of the Replicants is played by Rutger Hauer. At the end of the movie the two characters are pursuing each other through this broken down building. 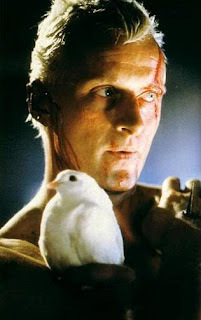 At one point, Roy Batty (Hauer's character) actually pushes a large nail through his hand to retain his consciousness. He knows that he is about to die. In the final scene, he actually saves Harrison Ford's characters life. Hauer sits down on the roof clutching a dove to his chest. He tells the cop,...ah, what the heck. I finally figured out how to get a video on here, so just watch it for yourself. I like the nice touch of the dove being released at the end and flying towards the sky like a soul going to heaven. Sitting in that theater, those lines made me think about Tell Hazor. They also made me think about America. In another hundred years or so, will the U.S. still be around? Will there still be Democrats and Republicans? Or will we be lost like tears in the rain just like Hazor? They will be His people, and He will live with them and be their God. Now THAT'S the kind of country I want to live in. "So this Idol worshipper goes to communion..."
God only hates you a little bit. Why Megan & I don't go to church.